Lynn will teach her method for string piecing with no foundation. With this fool proof technique, there is no extra layer of fabric in the quilt and no paper bits to pick out after the sewing is finished. 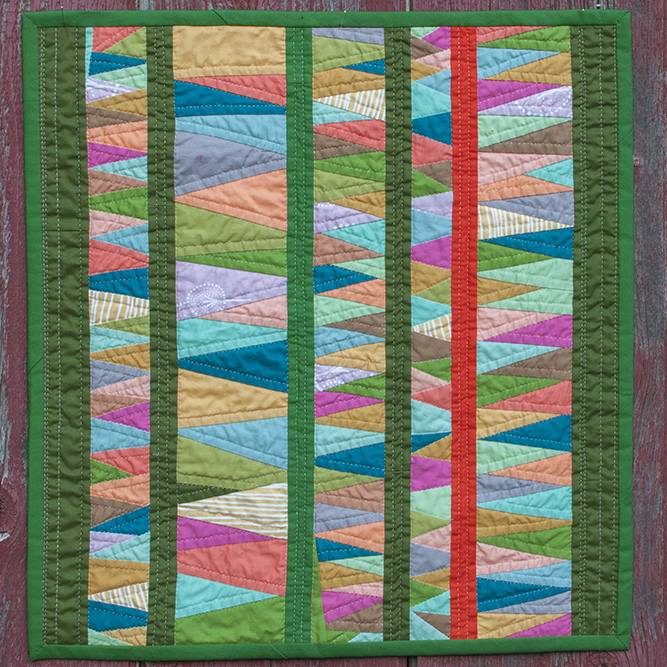 You will learn the skills needed to add string piecing to your own quilt designs. Bring your scrap bin and prepare to have some fun! One day or multi day class. All day or multi day workshop. Students will design their own pot or vase of flowers. You will learn to fold and free cut different kinds of flowers. Lynn’s needle turn applique technique makes it easy to achieve perfect applique circles and smooth curves. Points and corners are not a problem. Students will learn the techniques needed to master applique on inside curves, outside curves, inside corners, and outside corners. Lynn will also teach an easy way to applique vines and stems. Learn tips and tricks that make working small easier. Lynn will show you how to piece tiny stars, baskets, and other small blocks. With Lynn’s tips for working small you will be able to add a bit of tiny sparkle to your own quilt designs or make your own quilt completely from tiny blocks. 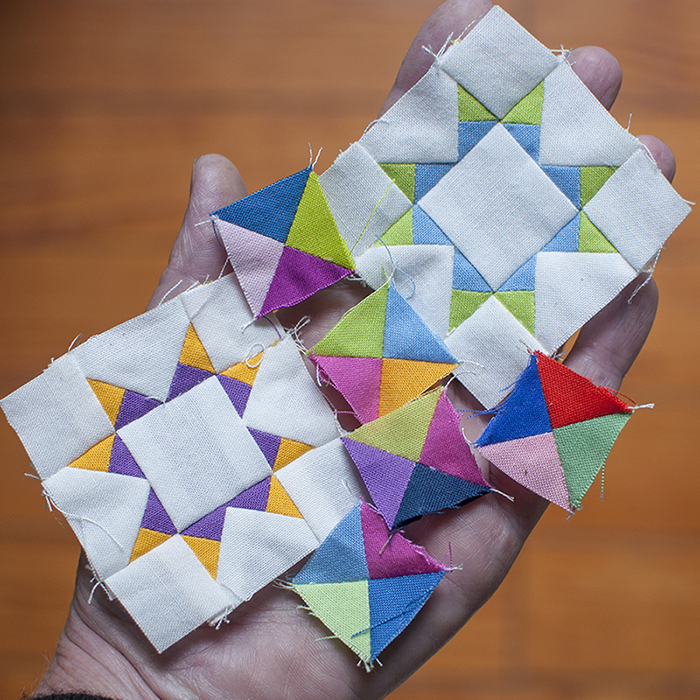 These precision pieced blocks can also be used in smaller projects such as a pincushion or pouch. This class explores the many possibilities to this traditional pattern. Intuitive piecing leads to many different interpretations of the simple design. Students can work at a large or small scale and with prints or solids or a mix of both. This technique can be used to make blocks that are ‘slightly’ liberated or a mix of block shapes and sizes that will be ‘puzzled’ together. Good for beginning or advanced, traditional or art quilter. Learn easy techniques for making knock-out quilts. When using solids, the emphasis is put on the shape of each piece of fabric. The lines and shapes become the focus of the quilt rather than the print of a fabric. The mood of the quilt is set by your piecing and color choice, not by a style of print. 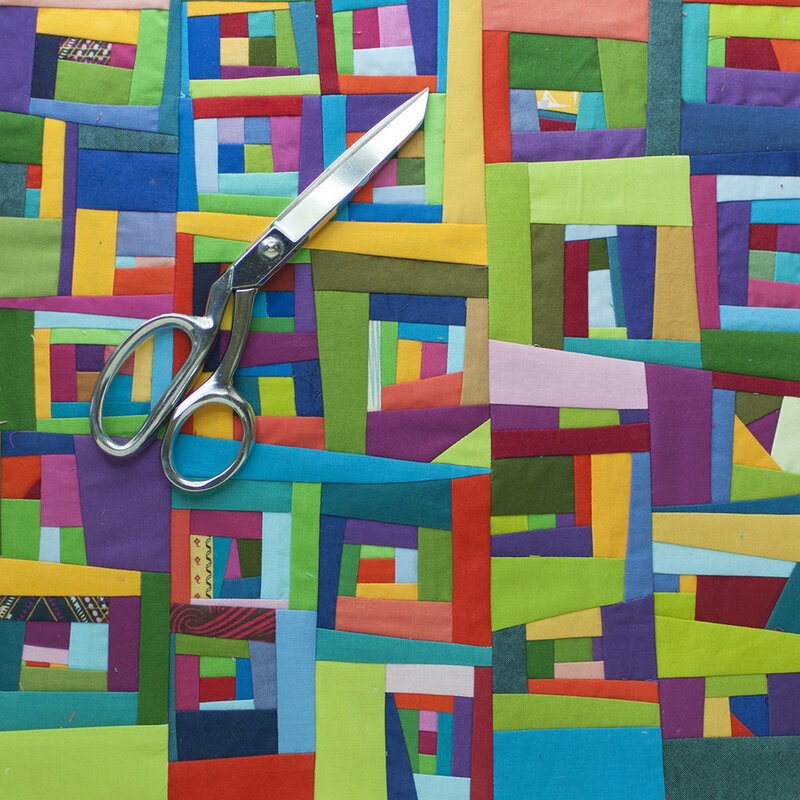 Working with free-form, improvisational construction, students will create their own, original quilts using easy to learn design concepts and techniques. Learn tips and tricks that make working small easier. Lynn will show you how to piece tiny stars, and other small precision blocks as well as small scale improvisational piecing. With Lynn’s tips for working small you will be able to add a bit of tiny sparkle to your own quilt designs or make your own quilt completely from tiny blocks like on the cover of Lynn’s book, Every Last Piece. This design class is good for the beginning and advanced, traditional and art quilter. Come and join the fun as Lynn shows you easy methods for creating your own original quilts. Lynn will share a number of techniques that can be used for small scale piecing. These skills lead to stress free quilts made of small pieces. Techniques include, skinny spike borders, tiny floating squares, skinny inserts, small curved pieces, and miniature log cabin variations. Small compositions made in class can be put into large or small quilts as well as used in small projects such as a pincushion or pouch. Lynn’s needle turn applique technique makes it easy to achieve perfect applique circles and smooth curves. Points and corners are not a problem. Choose one of Lynn’s Fleur-de-lis patterns, designed to teach you all of the skills needed to applique any other shape or design. You will learn the techniques needed to master applique on inside curves, outside curves, inside corners, and outside corners. The applique piece can later be made into a pillow top or small wall hanging, or used as the center of a medallion quilt. Do it for the Process Lynn will share some of her quilts and talk about her journey from the first quilt she made as a teenager in 1976 to her current work. She has found that the steps of making a quilt are often more meaningful to her than the completed quilt. Focusing on the creative process rather than the finished product allows her time in the studio to be filled with play and discovery.